During the summer months, the tiny boardwalk community of Telegraph Cove becomes a hive of activity. Boaters arrive after cruising Johnstone Strait while boating tours departing from Telegraph Cove head out for the day. Each year Telegraph Cove hosts an arts and crafts fair and fishing derby which draws crowds from other regions of the island as well as many tourists. Telegraph Cove, artist and craft show, British Columbia, Canada. 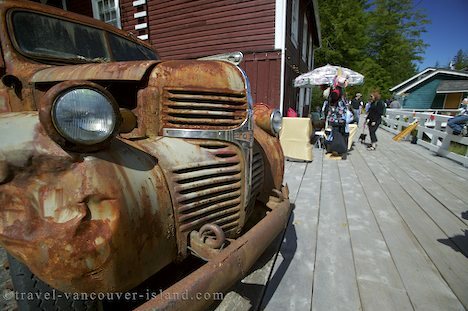 Picture of the old truck on the boardwalk at Telegraph Cove, Northern Vancouver Island, BC.